Don’t have much space, but still want to be able to work out at home? Hate having to go to the gym to stay fit? Despise sharing and having to wait to use the equipment you want at the gym? Well let us make all your problems go away. How does a multi-station gym that fits right in your home, and that comes with a life time warranty sound? Like it doesn’t exist? Well it does. I have got to be honest with you, there have been many times I have signed up for gym memberships and end up not using them. Until I realized what I really need to motivate me, a workout buddy! 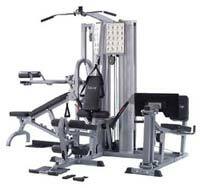 That is why this piece of home exercise equipment is vital to people that love to work out with others, but still in the privacy of your own home. The BodyCraft k2 has two working stations perfect for couples that like to work out, maybe even a mother and daughter tandem that love to stay fit. With its strong and great quality frame it came be trusted to keep you in shape for years to come! As stated earlier, even if it does break, tatter or get worn out; it comes with a life time warranty! So buy it once, and use it forever! If we want quality we have to be prepared to pay the price, this product may not be cheap but it is also not too pricey. For $ 2,999 you can get the Bodycraft k2 right now and enjoy all its features right away. You will be making the right choice seeing as even if it does go through a lot of wear and tear, it has a life time warranty! So get that body that you’ve always wanted, perfect as a gift for you hubby, or even just a new addition to your home the Bodycraft k2 is the right choice!